Should I Spend Donuts on the Returning Pagan Bonfire, Ruin Bundle, Mayan Marge or Mayan Calendar (and God)? Time to grab toast as we travel back…wayyyy back…in time with Homer in the all new TTT (Time Travel Toaster) event! Homer’s taken us back to the Egyptian Era and we’ve got Pharaohs, Pyramids & of course other Egyptian items in our Springfield just tempting us with those sprinkles! My Opinion On It Now: Meh. It’s still pretty expensive (even with the rebate). While it’s a nice bonus % there are far better items in the game for bonus %. It is nice that it comes with a task and gives a cash payout as well..so if you like it grab it. Otherwise pass. What Does It Do? : Decorations, so not a whole lot. Task at the Catacombs for Bart. My Opinion On It Now: Eh, to me this is one to pass on. What Does It Do? : Nothing. Mayan God is an NPC. If you have Mayan Marge there’s a task at the Calendar there for her, otherwise nothing. What Does It Do? : Playable character, however you’ll need the Mayan Calendar to unlock all of her tasks. Potential Questline Issues: You’ll need Mayan Homer (who is NOT offered) to complete her questline. This causes a big problem for many of you. My Opinion On It Now: Pass. Of all Marge’s costumes this is my least favorite. That coupled with the questline issues, pass. What are your thoughts on this batch of returning premium items? Will you be spending donuts to bring any of them to your Springfield? Have you already? Do you already own any of them? Sound off in the comments below, you know we love hearing from you! 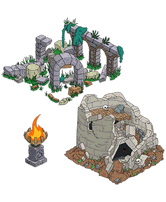 This entry was posted in Buildings, Characters, Decorations, Donuts, Should I Buy, Tapped Out, Updates and tagged Should I Buy Mayan Calendar, should I buy Mayan Marge, Should I Buy Pagan Bonfire, Should I buy Ruin Bundle, Should I Buy Sacred Parchment, Should I Buy the Flaming Torch, Should I Buy the Guillotine, should I buy the Medieval Banners, Tapped Out Tips and Tricks, The Simpsons Tapped Out, Time Travel Toaster Update, Toaster Time Travel Event, TSTO Addicts, TSTO Time Travel Event, TSTO Tips and Tricks, TTT Update. Bookmark the permalink. I’m another player feeling cheated because of the whole Mayan thing. Bought Marge’s skin because I liked it, found out I needed the calendar, bought it too after some cursing and ranting, and now I still can’t use Marge! RIP, 160 Donuts! And I’m a freemium player! So angry. Save your Donuts / Bonuts! This purchase has ticked me off the most EA!!!! I feel burned and am passing on a lot of purchases now. I bought Marge because I liked her costume. Looked at her tasks & was miffed the calendar was required for the visual task. Went ahead & bought the calendar even though I didn’t want it, then found out even with the calendar it still required a quest. Why offer Mayan Marge & NOT offer Homer, who is required??? EA blew it on this one!!! I was waiting for the mayan stuff for a long time. 300 donuts for the bundle was too much last time. Unfortunately Mayan Homer isn’t purchasable but I bought Mayan Marge and the calendar very soon and before this post was live… Now I’am very annoyed that I can’t start the questline and especially that I cannot send her to the visual tasks. I can see ppl jumping on the Mayan Calendar+God deal without knowing the item has no payout bonus and the character is npc. Grabbed the pagan bonfire. I like rebates!!! I was getting sick of Marge’s other two premium costumes so I bought the Mayan Marge one. Little did I know that I couldn’t use it because I don’t have Mayan Homer. EA, you owe me donuts for this. I completely agree, I want my donuts back for Mayan Marge & the Mayan Calendar! Or they should give everyone who bought them Mayan Homer for free!!! Bad bad move EA!!! Yep EA really screwed up on this one!!! I want a refund, they can have Mayan Marge and the Mayan calendar back!!! EA came make it up to you and all other victims, by giving Mayan Homer for free. It would seem to me releasing the Mayan Homer, Marge, and the God together would be a no brainer. It would be even better if they had a bundle with all 3 of them together. At any rate I am going to wait until I can get all 3 at the same time preferably at some kind of discount. EA dont play the game, they probably dont know how the game works…. 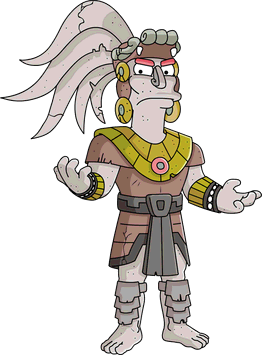 I would get Mayan Marge…knowing she too isn’t really worth it…but without Mayan Homer, she’s a hard pass. If you have Crazy Iguana Lady, some of her non-visual tasks shift to the Calendar when you buy it. I already had Mayem Homer and the Mayem God, so buying Mayan Marge was the rifght decision for me. As long EA doesn’t deliver Mayan Homer, buying the god and Marge is not advisable! I picked up the pagan bonfire thinking it was a bundle. Nope. Oh well it feeds EA. The whole Simpson family (including Maggie) can dance around it…a 4 hr task…their costumes go great with the prehistoric stuff. I had it in front of Moe’s cave (as the entertainment) until my area got too crowded. Are the costumes part of the task, or do you have to have Mayan skins for the characters? You don’t need the Mayan skins for that task. Part of the task as far as I can tell. The switch into them at the beginning of the task. Thanks to you and Rudolph for the info! Follow-up question… How long is that task? Having one half of a pair of premium characters only is insane, especially if you need both for the questline. I know! Wth is EA thinking? Not being able to complete her quest line would infuriate me. It is infuriating me! EA needs to correct this or they’re going to be losing sales!! !